For the second week in a row, both the monthly and the weekly indicators rebounded. Jobs were up 56,000 in September (not counting the returned 47,000 Verizon strikers). July and August were also revised 100,000 higher. Aggregate hours also improved. The manufacturing workweek, a leading indicator, did slightly decline. Auto sales came in strong, continuing their post-tsunami rebound. Construction spending was also up strongly. Factory orders declined slightly. Most of the high frequency weekly indicators continued their rebound this week. On the jobs front, adjusting +1.07% due to the 2011 tax compromise, there was a strong improvement in withholding taxes as shown in the Daily Treasury Statement. For the first 3 days of October, $33.7 B was collected vs. $30.6 a year ago. For the last 20 days, $133.4B was collected vs. $123.8 B last year, for a 10% YoY gain. This comes after several actual negative readings in September. The BLS reported that Initial jobless claims rose 10,000 to 401,000. The four week average decreased to 414,000. This is still among the lowest numbers in the last 6 months. The American Staffing Association Index, however, was flat at 90. This is only the second week that this series has broken out of its 87-88 range after 3 months. The index is once again below its reading from a year ago. There was mixed news on housing. Housing prices, as measured by median asking house prices from 54 metropolitan areas at Housing Tracker showed that the asking prices declined a mere -0.9% YoY. This is yet another record smallest YoY decline in the 5 1/2 year history of this series (YoY measurements were possible beginning in April 2007). The areas with YoY% increases in price increased by two to 16. The areas with double-digit YoY% declines remained at only 2. If the current trend continues, nationwide asking prices will be YoY positive by next month sometime. The Mortgage Bankers' Association, however, reported that seasonally adjusted purchase mortgage applications decreased 1.7% last week. On a YoY basis, purchase applications were down 12.2%. The longer term trend in purchase mortgage applications has been flat for the last 17 months. Refinancing decreased -5.2% w/w despite record low interest rates. Rail traffic also had another good - actually excellent - week. The American Association of Railroads reported that total carloads increased 4.6% YoY, up about 10,000 carloads YoY to 563,000. This is the highest level of freight since the recession. Intermodal traffic (a proxy for imports and exports) was up 10,600 carloads, or 4.4% YoY. The remaining baseline plus cyclical traffic increased over 14,000 carloads, or +4.7% YoY. Rail traffic had been negative YoY for 6 of the 12 previous weeks, and this is the best YoY comparison in months. Retail same store sales had a good performance as well. The ICSC reported that same store sales for the week of October 1 increased a strong 3.7% YoY, and increased 0.1% week over week. Shoppertrak did not report, although Redbook also reported a 4.1% YoY gain. The Money supply surge appears to have ended. M1 gained 1.5% for the week. It remains up 0.4% m/m, and 20.0% YoY, so Real M1 was up 16.2%. M2 declined gained 0.4% w/w. It remained up 0.3% m/m, and 10.1% YoY, so Real M2 was up 6.3%. 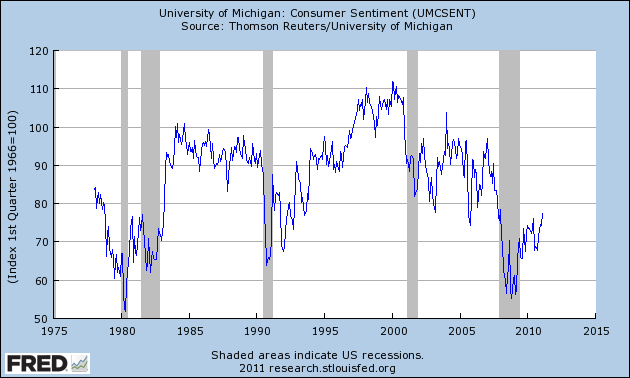 The YoY increase in both M1 and M2 continue at very strong levels. Weekly BAA commercial bond rates increased .13% to 5.31%. Yields on 10 year treasury bonds increased .10% to 1.98%. The spread between the two rates thus increased again. Oil traded at ~$82.70 a barrel midday Friday. This is about $12 below its recession-trigger level. Gas at the pump fell $.08 more to $3.43 a gallon. Measured this way, we probably are still about $.15 above the 2008 recession trigger level. Gasoline usage was down -0.3% YoY, at 8959 M gallons vs. 8989 M a year ago. 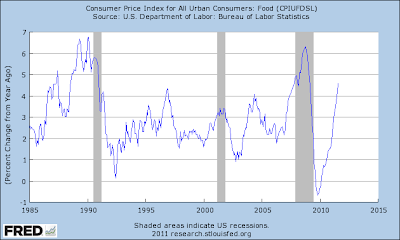 Falling gasoline prices should stimulate the economy - which will cause gasoline prices to rise again. It's nice to have mainly positive reports for a change. The post- debt debacle stall may be lifting a bit. The rebound in auto sales should help produce a positive 3Q GDP report. With continued positive employment numbers, it is unlikely any recession began in September. P.S. I am out of the country on vacation this coming week, so there may not be any "weekly indicators" report. In the meantime, have a nice weekend! Which, of course some people would agree with. All of which tie into my job, which is captive insurance structuring, along with estate planning and asset protection. If you see a tweet that doesn't apply to you, please just move on. Also, please post your twitter accounts in the comments so I can follow you as well. Nonfarm payroll employment edged up by 103,000 in September, and the unemployment rate held at 9.1 percent, the U.S. Bureau of Labor Statistics reported today. The increase in employment partially reflected the return to payrolls of about 45,000 telecommunications workers who had been on strike in August. In September, job gains occurred in professional and business services, health care, and construction. 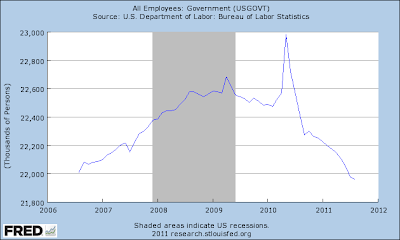 Government employment continued to trend down. So we basically have two NFP numbers: that with and without the strike. Without the strike, we have a gain of 58,000. Either way, the overall number is unimpressive. It shows there has been some hiring around the edges, but not broad-based, "we need to hire as many people as possible" movement on the part of employers. Most importantly, it doesn't help to dent the entry of new people coming into the workforce nor lower the unemployment rate for those who are long-term unemployed. The number of unemployed persons, at 14.0 million, was essentially unchanged in September, and the unemployment rate was 9.1 percent. Since April, the rate has held in a narrow range from 9.0 to 9.2 percent. This tells is the overall situation isn't getting any worse. That's actually not bad, especially considering the overall economic news we've seen over the last few months. Total nonfarm payroll employment edged up by 103,000 in September. Since April, payroll employment has increased by an average of 72,000 per month, compared with an average of 161,000 for the prior 7 months. In September, job gains occurred in professional and business services, health care, and construction. 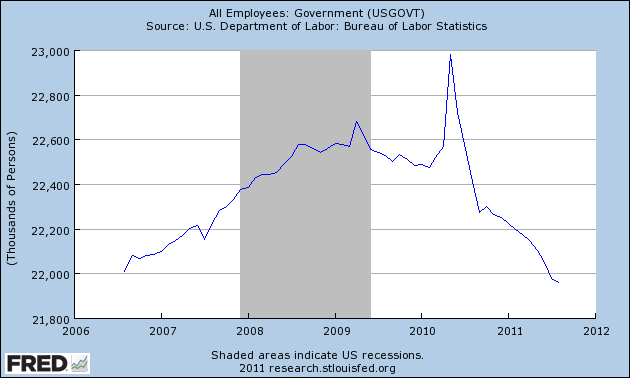 Government employment continued to trend down. The slowdown in overall job growth is very troubling, especially considering we're two years into the recovery. In an ideal economic world, we'd be seeing an acceleration of demand leading to an increase in job creation. Instead, we have a more or less stagnant environment. Employment in temporary help services edged up in September; this industry has added 53,000 jobs over the past 3 months. In September, employment growth continued in computer systems design and in management and technical consulting services. This is a problem, as temp workers typically lead overall employment. So , the slowdown is concerning. Government employment continued to trend down over the month (-34,000). The U.S. Postal Service continued to lose jobs (-5,000). Local government employment declined by 35,000 and has fallen by 535,000 since September 2008. This is something I've pointed out before. I believe this is bigger problem than its given credit for and I believe is a primary reason for initial unemployment claims hovering around 400,000 for the last year. Construction employment increased by 26,000 over the month, after showing little movement since February. The over-the-month gain was due to employment increases in the nonresidential construction industries, which includes heavy and civil construction. This is about the only really good news in the report, but it's only one month of data. The good news is prices for the IWMs have moved through key support in the roughly 65 price are and have advanced above the 10 and 20 day EMA. 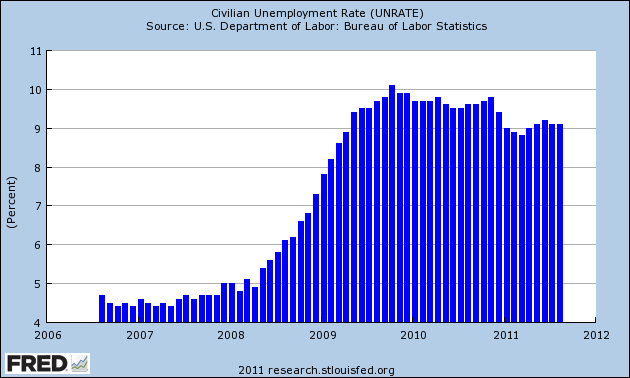 This provides us with some technical support in the event the jobs report is less than stellar. However, don't get your hopes up; they underlying economic fundamentals are still very weak, so strong upward advances just are not in the cards right now. There may be a turn of events starting in the Treasury market. While I typically dislike line charts, they can show trends with less static. The upper chart shows that prices may have broken support, which is somewhat confirmed by the lower, candle chart. I say somewhat because the break is still fresh and there is plenty of uneasiness about the underlying economy right now, making Treasuries attractive. ECRI's recession call has justifiably gotten much coverage. On the other hand, many have noted the lack of transparency of their method, making reliance on them a matter of trust rather than testing. An alternative to their approach is based on the research of UCLA Anderson School Prof. Edward Leamer. Prof. Leamer made an excellent presentation[pdf] about the progression of business cycles at Jackson Hole in 2007. It is research I have relied on many times, including being able to see the beginning of the Great Recession ahead of time. "The temporal ordering of the spending weakness is: residential investment, consumer durables, consumer nondurables and consumer services before the recession, and then, once the recession officially commences, business spending on the short-lived assets, equipment and software, and, last, business spending on the long-lived assets, offices and factories. The ordering of the recovery is exactly the same." Leamer made use of a mathematical kernal to calculate the relative contribution of housing and the other components to GDP during expansions and recessions, but the raw numbers are persuasive on their own accord. Here are housing permits (blue), vehicle sales (red),since 1974 and non-vehicle real retail sales (green) since that series began in the 1990s (normed to 100 as of December 2007):. The order of the decline from post-recession highs certainly fits Leamer's research, but the amplitude (compare the top graph) is almost trivial. In the past, housing permits have had to fall 200,000 or more from their high before a recession was triggered. From post recession high (688,000) to trough (534,000) was 154,000 -- enough for a significant knock on growth, but not sufficient alone based on past episodes to actually trigger a downturn. The post-tsunami downturn in auto sales this year was 1.7M, from 13.2M to 11.5M annualized -- or just barely consistent with a recession in the past. is "far worse" than it was just three months ago. Considering the weak, revised data for the first half of the year, the forecast calls for average Gross Domestic Product growth of just 0.9% on average for the next five quarters and ending in the first quarter of 2012. However, the Forecast economists remain steadfast in their assertion that the United States is not currently in a recession, nor is there a recession in the forecast through 2013. "Simply put, the three sectors that would normally put the economy into recession are already depressed; housing, consumer durables and inventories,".... If we are to have a new recession it would have to come from a collapse in exports, a generalized decline in consumer spending with a resultant decline in business investment. All plausible, but we are not forecasting that eventuality." Based on the above data, I would go slightly further. Both housing and vehicle sales now appear to have rebounded and are in an uptrend. That's why last week I said that Monday's auto sales data would be so important. It is simply hard to imagine anything worse than the just-barely-a recession 2001 downturn being consistent with this leading data. I remember when I got my first iPhone. I spent a few months telling my then wife-to-be all the great uses I could find for it. I distinctly remember telling her that we could use the map feature to chart out our then house hunting endeavors and that we could find nearby restaurants during the process. Eventually she said, "I'm not going to get one for you for a present," so I bought one within a few weeks and have been hooked on the product ever since. Jobs was a one-of-a-kind and probably once-in-a-lifetime figure. Apple products are uniquely simple, which I believe is the sign of true genius. It's like listening the Miles Davis play a melody; it sounds so simple until you try and transcribe it. Then you realize the depth of the nuances involved. Most importantly, Jobs was celebrated, raising the inventor to a new high in the public's mind. Personally, I think that is what made him incredibly important -- that he was a hero who was a nerd. There are some big shoes to fill at Apple. I hope someone, or a group of people, step up to the challenge. The 5-minute chart shows the strength of the latest sell-off -- one which lasted for 6 days. That's one heck of a drop. Prices have since rebounded to a fib level, and are just above an important price area (roughly 113.3-114). However, prices are still in a downward sloping channel, restricted by the downward sloping EMAs. 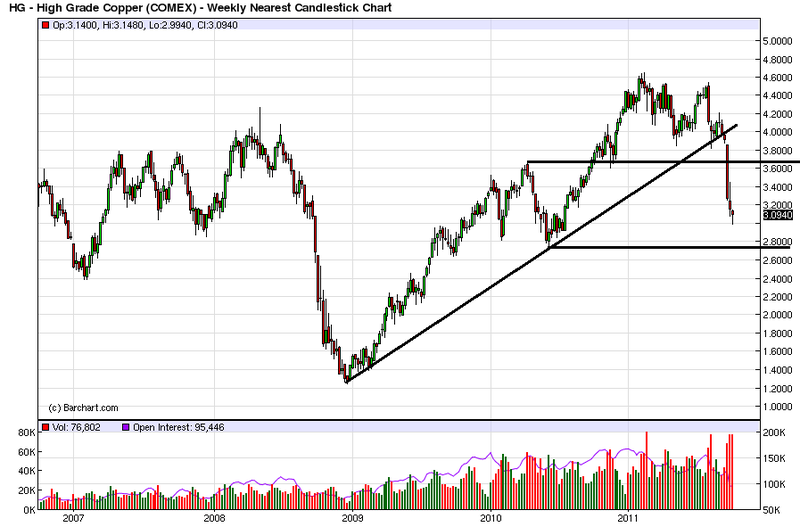 Until prices get above the EMAs and trendline, this is nothing more than a reaction rally. 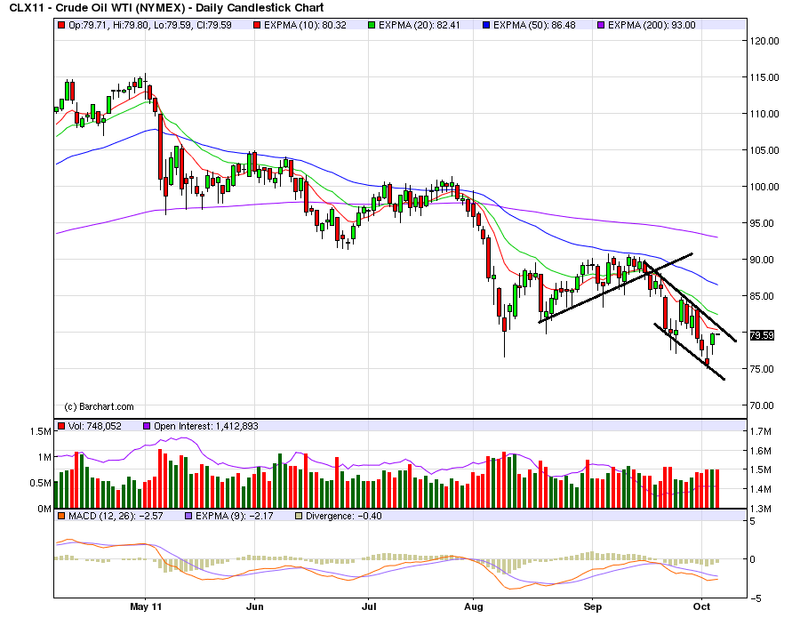 Oil is still in a very solid downtrend. First, the overall 6-month trend is very negative. Prices are below the 200 day EMA )along with the others). All the EMAs are moving lower and prices are in a downward sloping channel. Before saying prices have turned around, we need to see prices move through the 10 and 20 day EMA (which would also have them breaking the current upper channel line) and move to at least the 85 price level. But remember that the 50 day 200 day EMA are also moving lower, telling us the longer term trend is down for now. The dollar is in a clear uptrend. It has broken through key resistance and is using the EMAs for technical support. All the EMAs are moving higher and the shorter EMAs are above the longer (with the exception of the 50 day EMA). I'd go long when prices hit the 10 day EMA with a sell stop below just in case the EU actually gets their act together. Looking at the latest Flow of Funds report, we see that real estate wealth dropped from $18.251 trillion in 1Q11 to $18.160 trillion, or a drop of .5%. In addition, over the same period, financial assets decreased from $49.544 trillion to $49.411 trillion, or a drop of .26%, And that number does not take into account the tremendous drop over the last few months in the stock markets -- along with the increased uncertainty created by the debt debacle. The pace of household debt acquisition has also been slowing over the last few years, but the financial obligations ratio has also been dropping. Stripping out the census bump, we see that total government jobs have been steadily decreasing to the tune of 600,000. That's a tremendous drag on employment growth -- and is probably a reason why initial claims for unemployment have remained stubbornly high. 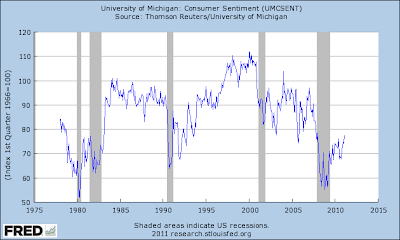 Note that readings are incredible low, especially considering the economy has been out of recession for a few years. In short, the consumer has plenty of reasons to be depressed right now. The strongest sectors of the economy right now are auto sales and production, and capital goods shipments and exports. Auto sales rose during Q3, averaging 12.5 million units (saar), up 2.5% from Q2’s pace of 12.2 million units. That doesn’t seem like much, but it is boosting production. More importantly, sales ended the quarter very strongly at 13.1 million units. If they hold at that pace during Q4, then auto sales will also boost the current quarter’s real GDP. They might even do better given the decline in gasoline prices. That seems to be boosting demand for light trucks, which rose to 6.0 million units (saar) during September, the best pace since March 2008. Another strong sector is the capital goods industry, where orders, shipments, and exports rose to new cyclical highs in August. Orders for machinery rose to a new record high during the month, led by construction & farm machinery. Also rebounding strongly are civilian aircraft orders and mining, oil field, and gas field machinery shipments. On the other hand, orders for electrical equipment have been edging down since late last year. Despite the late day rally, the markets are still in poor technical shape. The IWMs, SPYs and DIAs are in downward sloping channels. Although prices rallied yesterday, they must move through the descending EMAs in order to show real strength. Also note all the EMAs are moving lower and are above all the prices. In short, prices are literally hanging on by their fingernails. In contrast, the treasury market is still rallying. All the EMAs are moving higher, and prices are in a clear uptrend. This market is the obvious beneficiary of unrest in equities. When viewed in conjunction with one another, we see a clear pattern emerge: equities are selling off and bonds are rallying as a result. Also note the equities are waiting for Friday's employment report. It that report is bad, we'll probably have a big and nasty sell-off. Retailers are coming to terms with a new reality: the consumer who traded down during the recession and never came back. Buffeted by high unemployment, heavy debt loads, falling home values and high food and gas prices, these shoppers have been whipped into a permanent state of consumer caution. They buy only what they need, avoid premium labels, clip coupons and scour sales. Wal-Mart Stores Inc. Chief Executive Mike Duke told analysts in a recent conference call that paycheck-cycle shopping is more pronounced than ever, with shoppers stocking up shortly after getting paid, then moving to smaller product sizes toward the end of the month when they run short of money. "Consumers are fragile, fatigued and fed up," said Chris Christopher, senior economist at IHS. Global Insight, citing wage stagnation, food inflation and high gas prices. Retailers and manufacturers are figuring out how to appeal to these new "forever frugal" consumers—rather than pin too much hope on economic rebound. Some are waiting longer to pass on higher costs, whether for food or cotton. Coca-Cola Co. and other companies have added new packages at small sizes and lower price tags. Some retailers are holding the line on hiring, even as they head into their busiest season of the year. Many stores are expanding their selection of cheaper private-label products and some are offering credit cards with across-the-board discounts. Layaway has made a comeback. In some ways, this is a good development. It indicates that consumers are far more likely to live within their means. However, the causes of it -- high unemployment and the downward pressure that bears on consumer sentiment -- are still with is, which is obviously a massive negative. I do think we are witnessing a profound change in overall consumer psychology in this area. Hope on the Food Inflation Front? 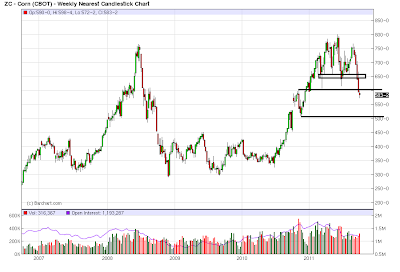 However, it appears that could be changing, thanks to the recent rout in commodities. This 5-year chart of soybeans is the most hopeful. Prices have been trading in a fairly tight consolidation pattern for the year, between 1300 and roughly 1425. 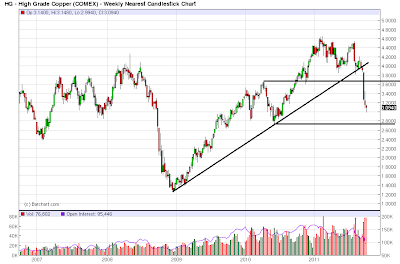 However, two weeks ago prices broke through support around the 1300 area and last week prices continued their sell-off. 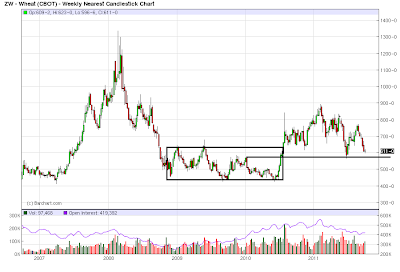 Now, it's important to note that soybeans are still at very high levels. But, it's encouraging from a price perspective to finally see them move through support. 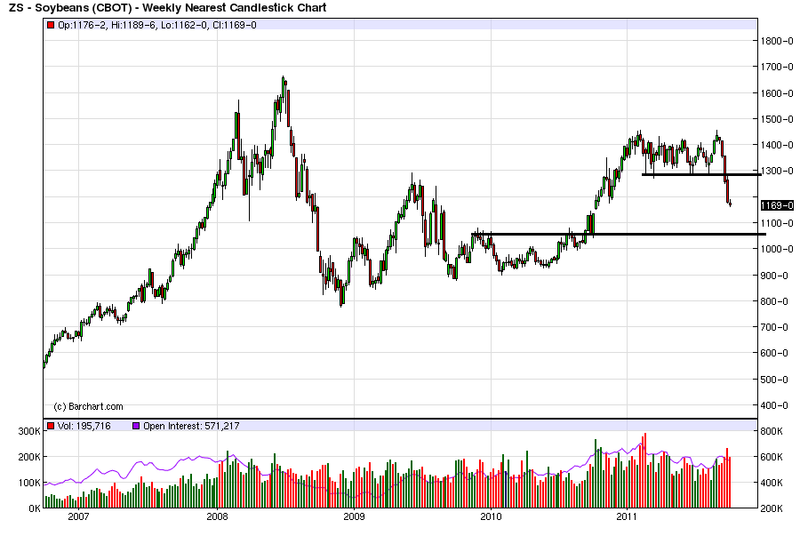 The chart for corn is also encouraging. After topping at 5-year highs, prices have now moved through several areas of crucial technical support. There is also plenty of room below prices to continue the downward move. Like soybeans, prices are still at high levels. However, they are now moving lower. Finally, there is wheat. 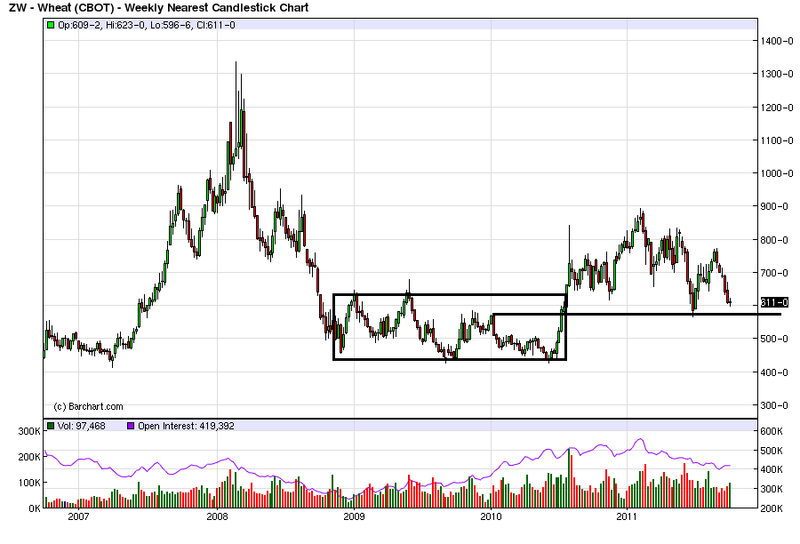 We saw wheat escalate in price over the last year, but it has not come near the levels it hit in the 2007-2008 rally. in the 2007-2008 sell-off, prices traded in a fairly tight range between 425 and 625. Now the 625 area is providing some support, as is the roughly 575 area. But, again note that wheat really wasn't the problem. 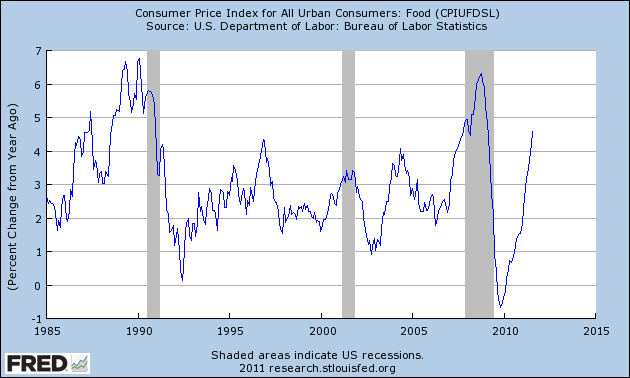 In short, it looks as though the commodity sell-off will help us with one very important area: food prices. As of this writing (12:30 CST) the IWMS (the Russell 2000) has moved through crucial support levels. The trading day could still end with a rally. But right now, we're in dangerous territory. The above chart is a 5 year chart of copper. It has broken a 2 1/2 year uptrend -- dropping sharply a few weeks ago. It has also moved through key support and moved lower by over 20% -- the definition of a bear market. 1.) Yes, there was an expansion. You don't create over 1 million jobs in a recession. However, total establishment jobs are still about 6.8 million below previous levels. 2.) Initial claims have yet to move below 400,000 in a big way. This indicates the labor market is in very weak shape. 3.) Exports were a primary driver of the last expansion. Because Europe and Asia are now slowing, this primary reason for the expansion is going away. Both note that copper has taken a nosedive and is now in recessionary territory. 4.) Because of the breadth of the downturn in their indicators, a recession is inevitable. 5.) He highlights that recent experience (1980-now) has been abnormal from a business cycle perspective. Shorter expansions (2-4 years) are more the historical norm. Here is a link to the NBER's recession dates, which confirms this statement. There are three reasons why I disagree with his argument. 2.) Housing is already very weak -- in fact, it never really recovered at tall. As NDD points out, you can't really have a recession if housing doesn't cooperate. 3.) The big Asian economies (India and China) are still growing at incredibly strong rates. While a slowdown is in the cards for both, the slowdown will be from high levels of growth (8%-10%). The other "issue" I have -- and that's a poor word to use but the only one I have -- is, to my knowledge, ECRI hasn't formally released their methodology. Part of that's understandable -- they have a proprietary system that, so far, has been pretty good. But when you're making calls for a new recession, I'd like to see the data you're using the market the call. Starting the week, here are the general observations about the four primary markets. 1.) Equities are in a very weak technical position. The riskier averages are right at support and the less risky assets (SPYs) are approaching the 112 level -- again. 2.) Treasuries continue to benefit from the safety bid and operation twist. 3.) Commodities are very weak. 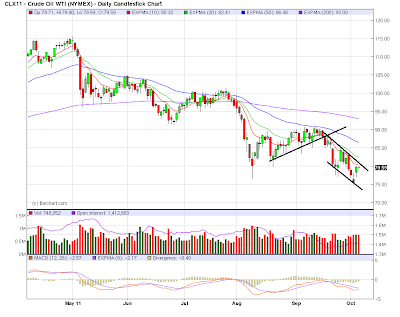 Oil is below its EMAs and 200 day EMA; copper is now in a bear market. 4.) The dollar has caught a safety bid, largely because it's the least dirty shirt in the hamper. Last week, I noted several times that the riskier equity markets -- the Russell 2000 -- were in a technically weak position, shown in the chart above. All the EMAs are moving lower and prices are using the EMAs as technical resistance. Prices are also at important technical levels -- for the fourth time in the last few months. None of these are bullish developments. 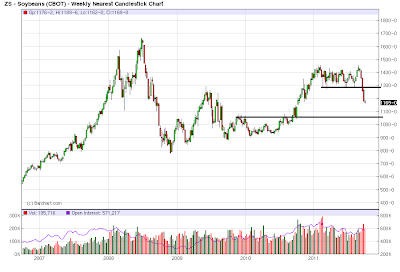 On the two year weekly chart, we see that prices are at important technical levels. Also note the next important price point is right around 60 -- a little over 6% below the current price. The QQQs - one step less risky than the IWMs but more risky than the SOYs, have broken a short uptrend and moved through recently established support a touch about 53. Notice how quickly this average fell from technical strength -- above the 200 day EMA and in a fairly decent rally -- to one of weakness. That's a very quick change. The SPYs are very weak technically as well; all the EMAs are moving lower and are providing technical resistance instead of support. Prices are also approaching the 112 area for the fourth time in the last few months -- a very poor sign indeed. The equity markets are literally hanging on by their fingernails. I would guess we'll see traders hang on until the employment report on Friday, but, if we get a bad report, expect a ton of technical damage to occur.